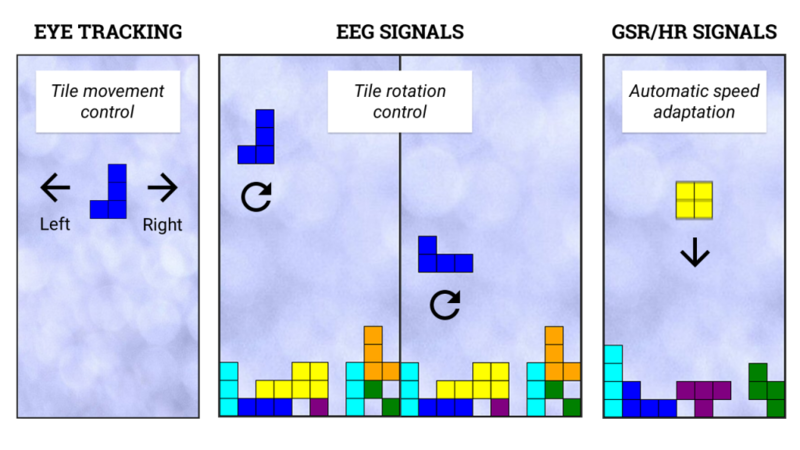 MAMEM is working on MM-Tetris, which is the multi-modal reinvention of the popular Tetris game, modified to be controlled with the users eye-movements, mental commands and bio-measurements. MM-Tetris is intended for use by motor-impaired people that are not able to operate computing devices through the regular controllers (i.e. mouse and keyboard). In this version of the game, the use of eye-movements and mental commands work in a complimentary fashion, by facilitating two different controls, the horizontal movement of the tiles through the coordinates of the gaze and the tile rotation through SMR signals detection respectively. Additionally, bio-measurements provide the stress levels of the player, which in turn determine the speed of the tile’s drop. In this way, the three modalities smoothly collaborate to facilitate playing a game like Tetris. Eventually, the design of the game offers bidirectional training (i.e. training of the system to detect SMR signals and training of the user to provide distinguishable signals), while it provides a natural gamified interface for user training in SMR signal detection. With this futuristic version of Tetris, the CERTH team has decided to compete in the Annual BCI Award for the World’s Most Innovative Brain-computer Interface project. The International Annual BCI-Research Award, is one of the top accolades in BCI research. The Award was created to recognize outstanding and innovative research in the field of Brain-Computer Interfaces. The Award is open to any brain-computer interface research worldwide and 12 projects are nominated before the winner is announced.